On Friday our classroom had a visit from two very special guests, Liz and Lucy. Liz is a wonderful woman who enjoys sharing a book and her beautiful dog with the children at McGregor. Lucy is a beautiful and huge dog called a Newfoundland. Lucy is 9 years old and she is very gentle. Lucy sits very quietly while Liz reads a book to the class. Our class was very excited to have Liz and Lucy read with us. Caleb even drew Lucy's Picture. Our class prepares to hear the story. 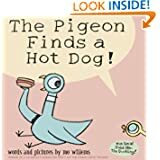 Today we enjoyed, The Pigeon Finds a Hot Dog! by Mo Willems. After the story each student had a chance to pet Lucy. It was a wonderful day of reading with Lucy. Caleb drew a picture for Lucy. Would you like to read a book to Lucy yourself? You can read to Lucy on Wednesday nights at 6:30 at the Rochester Hills Public Library. You must preregister by contacting Youth Services at 248-650-7140 or www.rhpl.org. Liz reading The Pigeon Finds a Hot Dog! Thank you Liz and Lucy!